ESPN "Outside the Lines" tracks Savannah State University Story. 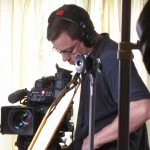 Go To Team Elite Camera Crew & Video Production Crew | ESPN “Outside the Lines” tracks Savannah State University Story. ESPN “Outside the Lines” tracks Savannah State University Story. Raleigh Based Jimmy Hall, along with Sound man Ian McCullen, and Charleston Based Dave Baker, and Sound man Carl Mullins met up with ESPN reporter Jemele Hill to cover a story that would span from North Carolina, to Georgia, To Sunny Florida in pursuit of the facts. The story? Ex-Savannah State University Football Coach Robby Wells claims that the Predominantly African American University Forced him to resign because he was white. After an interview with Mr. Wells in Charlotte North Carolina, “Outside the Lines” and GTT crews traveled South to Savannah State University to interview Employees and Administrators of the School on campus and shoot video of aSchool Rally while there. Then, off to Jacksonville, Florida to talk to others who may have been involved in the unfolding story. The Video turned out great courtesy of Hall and Baker’s lighting skills and a little help from a brace of Panasonic HDX900’s, complimented by several Kino-Flo Diva’s, and the arsenal of Arri Tungsten lights available in any Go To Team crew member’s Gear. Producer Art Burko was even able to log and see his footage on his laptop on the flight home courtesy of the realtime DVD dubs complete with timecode imprint provided by Dave and Jimmy on the shoot. Thanks to Ian McCullen for the pictures.